These are gritty, colloquial blue collar poems reeking of the sweat of hard physical labour and also of the fear & dangers of being on the job. 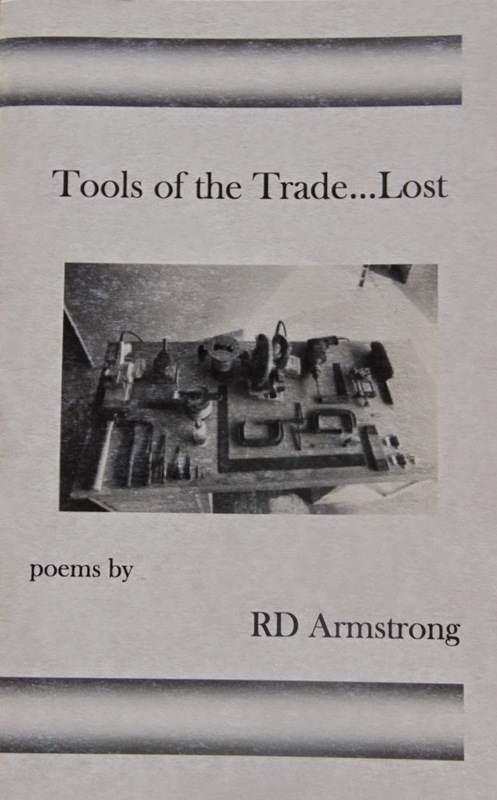 The cover photograph is by the poet RD Armstrong & upon close examination reveals a parody of a circuit board. As the title of the chapbook suggests, the traditional manufacturing 'tools of the trade' which have built post war America have now largely been lost and have been replaced by a global technological market- which we know has suppressed wages & has seriously compromised job security. The chapbook contains eleven poems, including ‘Post Hole Digger’ which was the winner of the 2014 Joe Hill Poetry Award. As is explained on the publishing details page, Joe Hill was a radical labor activist who was executed by firing squad in Utah in 1915 after copping a suspect murder conviction. The award is presented each year at the Great Labor Arts Exchange by The Heritage Foundation. tools on your way out. The focus of many of the other poems in this chap is on the occupational hazards- both physical & psychological faced by low paid, manual labourers. In ‘Slice of Life’ the speaker graphically explores the lethal trajectory of a spinning blade, “without a cool precision/ fate punishes distraction.” In ‘Tank Farm’ a spark ignites a vapour which blows Lou, a fellow worker, in half. In ‘The Bastards Are Waiting’ a paranoid worker rightly fears that everyone out there is trying to deprive him of his job. In ‘Building Blocks’ the speaker's obsessive preoccupation with his job intrudes into his daily life to the extent that it deadens his imaginative thought & desire. These are just a few of the 100+ books, chapbooks, anthologies and zines Lummox has published in the last 21 years.